Winter is always a season that is rather lacking in colour in my opinion. The world turns grey and white and without the bright summer colours of greens and pinks and purples from flowers and trees, it’s easy to get the winter blues. So of course I had to make something colourful to cheer us all up! These turquoise-y greens are lovely for this time of year so I hope you don’t shy away from colour! I do want to point out that the patten calls for 729 yards of yarn, but you won’t use all of that; you’ll have nearly one whole skein left over. So you could use a smaller hook for the cowl to save on yarn if you so choose. Isn’t this hat gorgeous? I just love it. 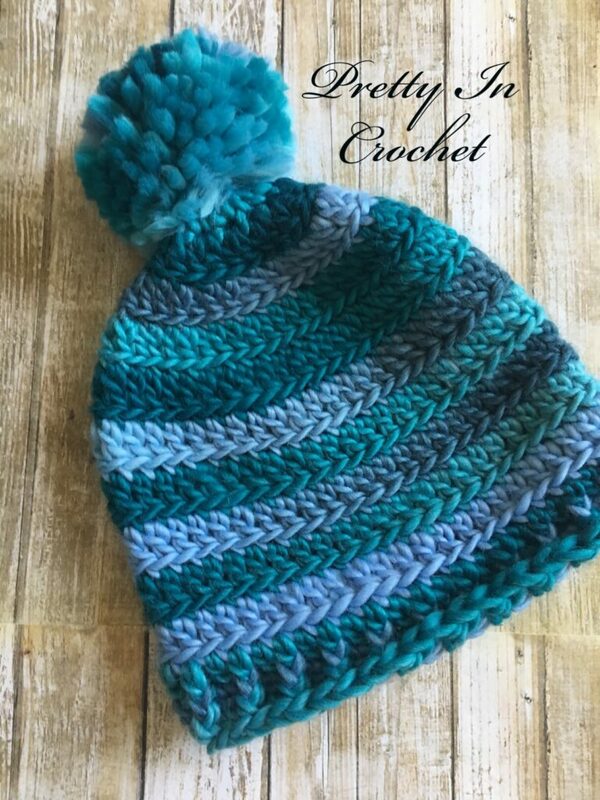 The self stripping yarn made this so easy to make and it looks totally fab. You’ll look totally cute snowshoeing or skating or even just dashing into the mall from your car. I love the way the look of the pompom too. It’s like a fluffy bunny tail! 7.00mm (K) hook 729 yards of yarn. 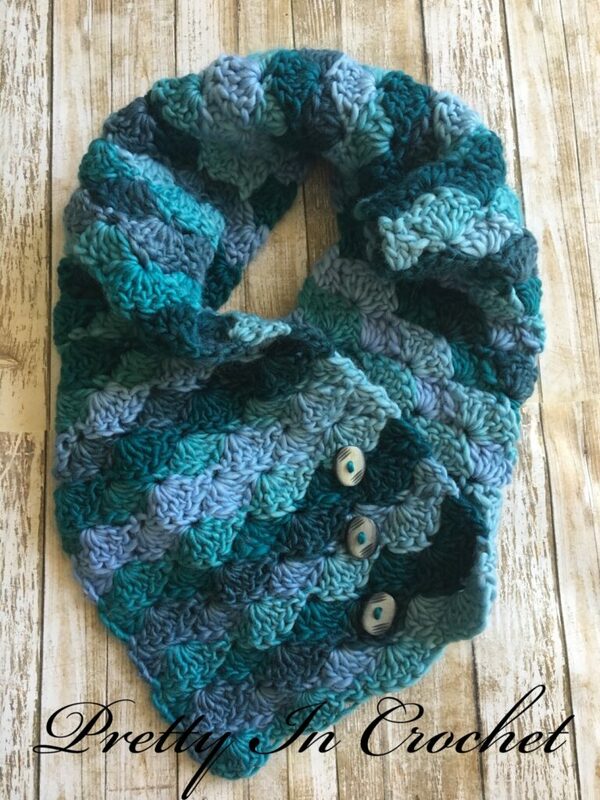 The cowl uses a lovely shell stitch and looks absolutely amazing. This yarn lends itself so well to a variety of stitches and I love the way this cowl turned out. This cowl is going to keep your neck warm and you’ll look very on trend as you stay warm. The winter greens hat and cowl are definitely projects that took me by surprise as they turned out far more beautiful than I had imagined. And this is why I love this yarn so much. It seems to work for just about any type of project you might have in mind! I hope you all enjoy hooking up this project. I loved making these pieces and I’m so happy I can share my love of yarn and crochet with you. 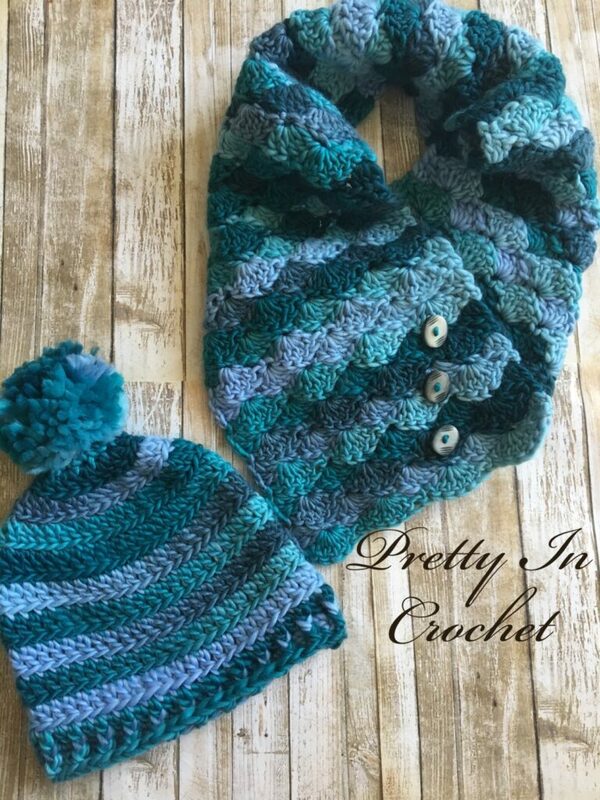 If you do make the hat and cowl, be sure to share on Instagram and add #prettyincrochet so I can see your pieces.